Flying from and between bases in China and India, the B-25s bombed every type of Japanese target during World War 2 in the China-Burma-India (CBI) Theatre, ultimately dropping more ordinance than their larger four-engined B-24 Liberator brethren. 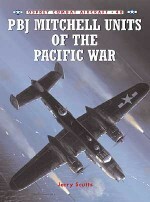 Mitchell bombers took on the task of disrupting the flow of Japanese supplies to the frontlines at medium ranges, bombing Japanese supply centres, railway depots and bridges. It was in this last capacity that the B-25 established a unique role as a ‘bridge-buster'. This provided significant support for the British Fourteenth Army as they advanced into Burma. Fully illustrated with detailed cutaway artwork, this book tells the important, yet forgotten story of B-25 operations in the CBI Theatre and the important role that this aircraft played on the road to victory. Edward M. Young is a retired financial executive with degrees in Political Science from Harvard University and the University of Washington. During his career he held assignments in New York, London, Tokyo and Hong Kong. He has written a number of books and numerous articles on aviation and military history. He is the author of eight Osprey books and lives in Seattle, Washington.Jim Laurier is a native of New England, growing up in New Hampshire and Massachusetts. He has been drawing since he could hold a pencil and throughout his life he has worked in many mediums creating artwork on a variety of subjects. He has worked on the Osprey Aviation list since 2000, and in that time he has produced some of the finest artwork seen in these volumes. He has specialised in aircraft of the Vietnam War period. He lives in New Hampshire, USA.